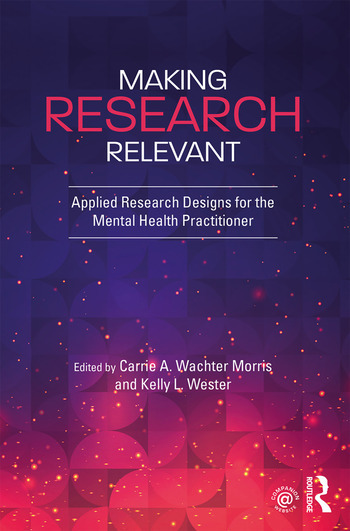 Making Research Relevant is the ideal core textbook for master’s-level introduction to research methods courses in mental health. Accessible and user friendly, it is designed to help trainees and practitioners understand, connect, and apply research to clinical practice and day-to-day work with students and clients. The text covers foundational concepts like research ethics and how to best consume research, as well as 11 applied, evaluative, and outcome-based research methods. Easy-to-read chapters are infused with case examples from diverse settings and paired with brief video lectures, which provide vignettes to guide application and visual components that demonstrate how research methods can benefit mental health practitioners in real-world scenarios. Carrie A. Wachter Morris, PhD, is an associate professor of counselor education at the University of North Carolina at Greensboro and past president of the Association of Assessment and Research in Counseling. Kelly L. Wester, PhD, is a professor of counselor education at the University of North Carolina at Greensboro. She has taught graduate courses in research and provided workshops on research methodology.